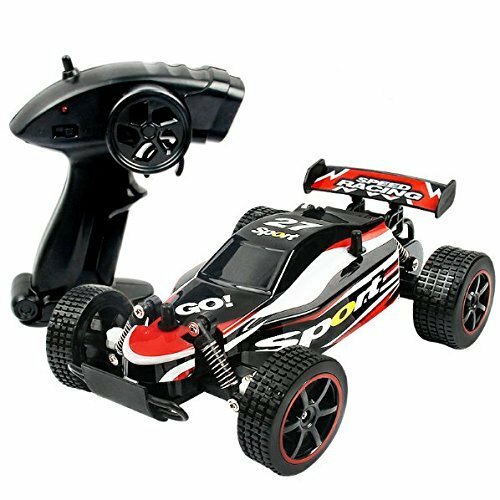 Using high-quality imported PVC materials which is super flexible to make the car more ruggedness and crashworthiness;Fixed with dozens of screws to ensure the rc car durable; The direction selector which is in the bottom could adjust the car automatically when it not walking a straight line. Four wheels independent suspension spring let cross-country car body more flexible and played shockproof function, protect electronic components inside the car body; Simulation tires which is made of high quality material with soft and elastic function can be adjusted based on the road; driving fast earthquake-resistant on uneven terrain, tire tread obvious: high friction, grip extremely strong skid resistance, doesn't fear the slippery road skid. Using strong horsepower power motor to let maximum spped reach 25 Km/h electric energy converted into power maximizely, two wheels drive for climbing car can provide strong power torque significantly make the car easy to complete difficult moves. No matter land, sandy beach, mud, wetlands, grasslands, Rugged stone mountain road, rocks and so on. 2.4Ghz radio remore control can support multiple cars playing at the same time;and the remote control distant is about 50 meters.Equipped with 3.7V 500mAh rechargeable batteries; The charging time is about 2.5 hours which can offer 20 minutes for playing. Amazing of this car is waterproof, it can go through puddles easily, and you don't need to worry about the water.It can even pop-up high water spray!If there is any other question,please contact us.